How Many Vehicle Sales Require a Georgia Dealer License? 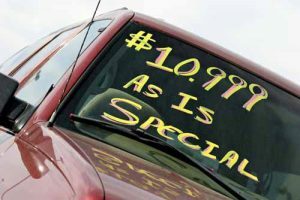 Used auto dealers may need a surety bond in order to obtain a business license. If you live in Georgia and you want to sell more than three used cars in a year, you must get a Used Motor Vehicle Dealer License. Obtaining a license is a process that includes completing an application, purchasing insurance, locating a place for your business and submitting to a background check. An important part of the licensing process also involves acquiring a surety bond for $35,000. This is a guarantee to your customers that you will conduct your business honestly and will uphold Georgia’s state laws. A Used Motor Vehicle Dealer License is valid for two years, and expires on March 31 of even-numbered years. The bond covers the same amount of time as the license. As with a license, the bond also expires on March 31 of even-numbered years. Used Motor Vehicle Parts Dealers in Georgia must also be bonded for $35,000. Premiums depend on various factors including the bond amount, the dealer’s financial strength, experience in the industry and stability in the market. New To The Bonding Process? If you’ve never been bonded before, SuretyGroup.com is here to help. We will shop around to give you the best rates and walk you through the bonding process. When it comes time to renew, we’ll send notifications so you won’t miss your renewal deadline. If you are a used Motor Vehicle Dealer or Used Motor Vehicle Parts Dealer in Georgia and you need a surety bond, you must purchase it from a Surety through a licensed agent, such as SuretyGroup.com. Call SuretyGroup.com at 1‑844‑432‑6637 or email info@suretygroup.com for a free, no-obligation quote.